Product Overview - First Mate Marine Inc. Figuring out the size of solar panel you need and matching it up with the various accessories required for a complete high performance system can be a daunting task. That is why our engineers have developed easy to install kits that contain everything you need for your solar system. See our Gallery of Installations for ideas on mounting your solar panel. 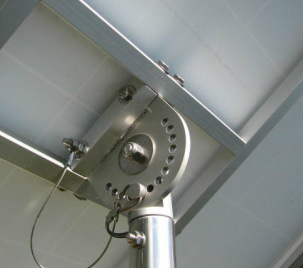 Our top-of-pole solar panel mount uses a unique tilt locking mechanism which enables 13 tilt angles for effective solar tracking. These panel mounts fit on a 1.5 inch OD rotating stainless steel pole and can be customized to fit most solar panels. 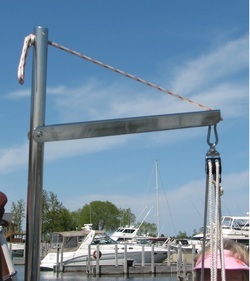 The pole is easily attached to your boat stern rail using our pole brackets. Moving the panel several time a day to track the sun can increase panel output by 30%. See our Blog or our Power Consumption Worksheet for information on how to size a solar panel for your needs. Click for more information about solar panel mounting systems. An optional Outboard Motor Lift can be attached to the pole adding function and saving space and money. mounting. Our solar panels are highly efficient and built to our rigid specifications. They are strong and nearly square in shape and are ideal for top-of-pole and bimini frame mounting applications. 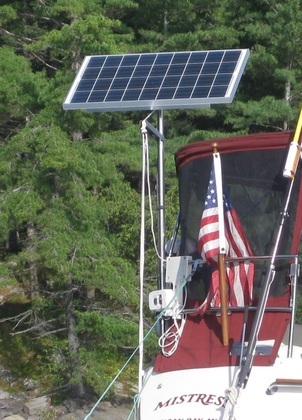 The panels we offer are designed to withstand the rigors of the marine environment. We offer top-of-pole solar panel mounting kits designed to accommodate a wide range of solar panel manufacturers. We also offer kits specific to our 100, 105, 130, 140, 150 and 160 watt panels. Click for more information about our solar panels. 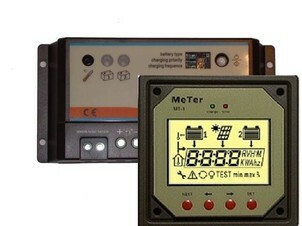 A charge controller regulates the voltage and current coming from your solar panels to your batteries. Most "12 volt" panels put out between 16 to 20 volts, so if there is no regulation the batteries may be damaged from overcharging. Most batteries need 14 to 14.5 volts to achieve a full charge. Many boats are equipped with two battery banks. Our controller is designed specifically for charging two independent battery banks. Click for more information about charge controllers. Our lift crane is designed to lift light loads up to 250 pounds. This crane is handy for lifting your outboard motor, provisions, or equipment to and from a dinghy. Simply lift the support line off the end of the crane arm and fold the arm against to pole for easy, out-of-the-way storage. The lift crane pole can also accommodate our solar panel mount creating one integrated unit. Click for more information about our lift crane.